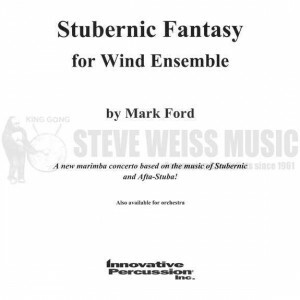 Stubernic Fantasy by Mark Ford is based on two of Ford’s compositions (Stubernic and Afta-Stuba) which were written for three players on one marimba. Stubernic (pronounced stew-bet-nick) was dedicated to Stefan and Mary K. Stuber with whom the composer attended college. In 1987, the Stubers went to Guatemala and Nicaragua for humanitarian aid purposes. Upon their return, they told Ford stories of their adventures and the many marimba bands they heard, especially in Guatemala. Ford was writing a vibraphone/marimba duet at the time, and decided to make it a trio on one marimba in the style of the Latin American marimba bands. Ford states, “The music for Stubernic reflects the passion and excitement of the music of Latin America, without borrowing any traditional themes or rhythms.” Stubernic requires the three players to navigate all over the instrument, even playing the instrument’s frame. The title Stubernic derives from Stuber’s last name and the first syllable of Nicaragua. The orchestral version of Stubernic Fantasy was premiered by the Opole Philharmonic Orchestra on October 5, 2012, in Opole, Poland, under Maestro Wojciech Rodek. The world premiere of the wind ensemble version at the 2012 MidWest Clinic in Chicago was conducted by Maestro Eugene Migliaro Corporon with the Lone Star Wind Orchestra. The soloists were Mark Ford, Christopher Deane and Brian Zator.